La Pinkardelo (Spinus pinus, iam Carduelis pinus), estas malgranda paserina birdo, membro de la familio de Fringedoj. Plenkreskuloj estas brunaj en supraj partoj kaj palaj en subaj partoj, kun forta strieco. Ili havas mallongan forkoforman voston. Ili havas flavajn makulojn en flugiloj kaj vosto, ne ĉiam videblaj; krome ili ŝajnas tre malgrandaj striecaj paseroj. Ties reproduktaj biotopoj troviĝas en Kanado, Alasko kaj la okcidentaj montoj kaj nordaj partoj de Usono. La nesto estas bone kaŝita sur horizontala branĉo de arbo, ofte konifero. La migrado de tiu nearktisa birdo estas tre varia, probable rilata al manĝodisponeblo. Grandaj kvantoj de birdoj povas moviĝi suden kelkajn jarojn; kaj neniaj aliajn. Pinkardeloj manĝante semojn de kardo. Tiuj birdoj manĝas en arboj, arbustoj kaj herboj. Ili manĝas ĉefe semojn, plantopartojn kaj kelkajn insektojn. Vintre ili ofte manĝas en miksitaj kunmanĝantaroj kiuj inkludas ekzemplerojn de Amerika kardelo kaj de Flamkardelo. Malgrandaj semoj, ĉefe de kardo, ruĝa alno, betulo kaj piceo faras majoritaton de la dieto de la Pinkardelo. Somere ili manĝas insektojn, ĉefe afidoj, per kiuj ili manĝigas la idojn, sed semoj hegemonias en ilia dieto. Kvankam konsiderata la plej komuna fringedo de Vaŝingtonio, la Pinkardelo suferis gravan jaran malpliiĝon en populacio el 1966, laŭ la Breeding Bird Survey. Pro la subitapera naturo de tiu specio, la populacioj ege varias el jaro al jaro, kaj tendencoj malfacile interpreteblas. Parazitado fare de la Brunkapa molotro povas draste efiki kontraus la produktiveco de la Pinkardelo, kaj arbarfragmentado pliigis sian kontakton kun la molotroj. Pluhavi grandajn arbarerojn de koniferoj helpus pluhavi tiun birdon kiel komuna. • Pinkardelo estas tre socia birdo. Ili kontruas nestojn apudajn unu al alia, kun eĉ nur malmulte inter ili. • Kiam manĝas en koniferoj, la Pinkardelo kutime pendas kapalteren el arbopintoj. • La Verda kardelo, S. spinus estas praulo de la Pinkardelo, Dominga kardelo, S. dominicensis, kaj de la Nigrakrona kardelo, S. atriceps. La subspecio S. pinus perplexus povus esti pli proksima al la S. atriceps; ili ambaŭ loĝas en la altebenaĵo de Gvatemalo kaj Meksiko. Dawson, W. R. 1997. Pine Siskin (Carduelis pinus). In The Birds of North America, No. 280 (A. Poole and F. Gill, eds.). The Academy of Natural Sciences, Philadelphia, PA, and The American Ornithologists’ Union, Washington, D.C.
Astheimer L, Ramenofsky M, Wingfield JC & Buttemer W. (1989). Corticosterone Feeding Behavior and Food Deprivation in Passerine Birds. American Zoologist. vol 29, no 4. Astheimer LB, Buttemer WA & Wingfield JC. (1992). Interactions of corticosterone with feeding, activity and metabolism in passerine birds. Ornis Scandinavica. vol 23, no 3. p. 355-365. Balph DF & Balph MH. (1979). 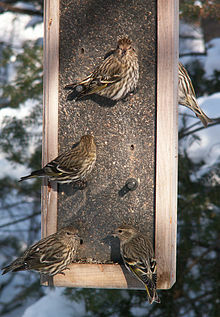 Behavioral Flexibility of Pine Siskins in Mixed Species Foraging Groups. Condor. vol 81, no 2. p. 211-212. Benkman CW & Lindholm AK. (1991). The Advantages and Evolution of a Morphological Novelty. Nature. vol 349, no 6309. p. 519-520. Bennetts RE & Hutto RL. (1985). Attraction of Social Fringillids to Mineral Salts an Experimental Study. Journal of Field Ornithology. vol 56, no 2. p. 187-189. Brogden KA & Packer RA. (1979). Comparison of Pasteurella-Multocida Serotyping Systems. American Journal of Veterinary Research. vol 40, no 9. p. 1332-1335. Brown WB. (1986). Late Pine Siskins in Ben Hill County Georgia USA. Oriole. vol 51, no 2-3. Buttemer WA, Astheimer LB & Wingfield JC. (1991). The Effect of Corticosterone on Standard Metabolic Rates of Small Passerine Birds. Journal of Comparative Physiology B Biochemical Systemic & Environmental Physiology. vol 161, no 4. p. 427-432. Cook AG. (1984). Birds of the Desert Region of Uintah County Utah USA. Great Basin Naturalist. vol 44, no 4. p. 584-620. Dawson WR & Marsh RL. (1986). Winter Fattening in the American Goldfinch Carduelis-Tristis and the Possible Role of Temperature in Its Regulation. Physiological Zoology. vol 59, no 3. p. 357-368. Dieni JS & Anderson SH. (1999). Effects of recent burning on breeding bird community structure in aspen forests. Journal of Field Ornithology. vol 70, no 4. p. 491-503. Elder DH. (2001). Forest tent caterpillars and birds. Ontario Birds. vol 19, no 2. p. 87-88. Erickson WR. (2004). Bird communities of the garry oak habitat in southwestern British Columbia. Canadian Field Naturalist. vol 118, no 3. p. 376-385. Farmer KL, Hill GE & Roberts SR. (2005). Susceptibility of wild songbirds to the house finch strain of Mycoplasma gallisepticum. Journal of Wildlife Diseases. vol 41, no 2. p. 317-325. Hahn TP, Pereyra ME, Sharbaugh SM & Bentley GE. (2004). Physiological responses to photoperiod in three cardueline finch species. General & Comparative Endocrinology. vol 137, no 1. p. 99-108. Hahn TP, Pereyra ME, Sharbaugh SM & Morton ML. (2002). Reproductive responses to long and short days in three high latitude species of cardueline finches. Hormones & Behavior. vol 41, no 4. Hejl SJ, Mack DE, Young JS, Bednarz JC & Hutto RL. (2002). Birds and changing landscape patterns in conifer forests of the north-central Rocky Mountains. Studies in Avian Biology. vol 25, p. 113-129. Herbers JR, Serrouya R & Maxcy KA. (2004). Effects of elevation and forest cover on winter birds in mature forest ecosystems of southern British Columbia. Canadian Journal of Zoology. vol 82, no 11. p. 1720-1730. Hill GE & McGraw KI. (2004). Correlated changes in male plumage coloration and female mate choice in cardueline finches. Animal Behaviour. vol 67, no 1. p. 27-35. Hobson KA & Schieck J. (1999). Changes in bird communities in boreal mixedwood forest: Harvest and wildfire effects over 30 years. Ecological Applications. vol 9, no 3. p. 849-863. Jennings DT & Crawford HS. (1983). Pine Siskin Preys on Egg Masses of the Spruce Budworm Choristoneura-Fumiferana Lepidoptera Tortricidae. Canadian Entomologist. vol 115, no 4. p. 439-440. Jim S & Keith AH. (2000). Bird communities associated with live residual tree patches within cut blocks and burned habitat in mixedwood boreal forests. Canadian Journal of Forest Research. vol 30, no 8. p. 1281. Kaufman K. (1993). Notes on goldfinch identification. American Birds. vol 47, no 1. p. 159-162. Keller ME & Anderson SH. (1992). Avian Use of Habitat Configurations Created by Forest Cutting in Southeastern Wyoming. Condor. vol 94, no 1. p. 55-65. Koenig WD. (2001). Synchrony and periodicity of eruptions by boreal birds. Condor. vol 103, no 4. p. 725-735. Kubisz MA. (1989). Burdock as a Hazard to Golden-Crowned Kinglets and Other Small Birds. Ontario Birds. vol 7, no 3. p. 112-114. Lagory KE, Lagory MK, Meyers DM & Herman SG. (1984). Niche Relationships in Wintering Mixed Species Flocks in Western Washington USA. Wilson Bulletin. vol 96, no 1. p. 108-116. Langelier LA & Garton EO. (1986). Management Guidelines for Increasing Populations of Birds That Feed on Western Spruce Budworm. U S Department of Agriculture Handbook. vol 653, p. 1-19. Larson DL & Bock CE. (1986). Eruptions of Some North American Boreal Seed-Eating Birds 1901-1980. Ibis. vol 128, no 1. p. 137-140. Lawler JJ, O'Connor RJ, Hunsaker CT, Jones KB, Loveland TR & White D. (2004). The effects of habitat resolution on models of avian diversity and distributions: a comparison of two land-cover classifications. Landscape Ecology. vol 19, no 5. p. 515-530. MacDougall-Shackleton SA & Hahn TP. (1999). Photorefractoriness and the evolution of reproductive flexibility in cardueline finches. American Zoologist. vol 39, no 5. MacDougall-Shackleton SA, Katti M & Hahn TP. (2006). Tests of absolute photorefractoriness in four species of cardueline finch that differ in reproductive schedule. Journal of Experimental Biology. vol 209, no 19. p. 3786-3794. Manuwal DA & Huff MH. (1987). Spring and Winter Bird Populations in a Douglas-Fir Forest Sere. Journal of Wildlife Management. vol 51, no 3. p. 586-595. McLaren IA, Morlan J, Smith PW, Gosselin M & Bailey SE. (1989). Eurasian Siskins in North America Distinguishing Females from Green-Morph Pine Siskins. American Birds. vol 43, no 5. p. 1268-1274. Medin DE. (1984). Breeding Birds of an Ancient Bristlecone Pine Pinus-Longavo Stand in East Central Nevada USA. Great Basin Naturalist. vol 44, no 2. p. 272-276. Moore T. (1990). Pine siskins remain until June in Fulton County. Oriole. vol 55, no 2-3. Nagle L, Kreutzer M & Vallet E. (2002). Adult female canaries respond to male song by calling. Ethology. vol 108, no 5. p. 463-472. Oberle MW & Haney JC. (1997). Possible breeding range extensions of northern forest birds in northeast Georgia. Oriole. vol 62, no 3-4. p. 35-44. Pereyra ME, MacDougall-Shackleton SA, Sharbaugh SM, Morton ML, Katti M & Hahn TP. (2001). Relationships between photorefrac-toriness and reproductive flexibility in cardueline finches. American Zoologist. vol 41, no 6. Pereyra ME, Sharbaugh SM & Hahn TP. (2003). Interspecific variation in photo-induced hypothalamic GnRH plasticity in cardueline finches. Integrative & Comparative Biology. vol 43, no 6. Pereyra ME, Sharbaugh SM & Hahn TP. (2005). Interspecific variation in photo-induced GnRH plasticity among nomadic cardueline finches. Brain Behavior & Evolution. vol 66, no 1. p. 35-49. Popp JW. (1988). Scanning Behavior of Finches in Mixed-Species Groups. Condor. vol 90, no 2. p. 510-512. Popp JW. (1989). Use of Agonistic Displays by Purple Finches During Interspecific Encounters. Bird Behavior. vol 8, no 1. p. 48-50. Prescott DRC. (1985). Feeding at Night by Wintering Pine Siskins Carduelis-Pinus. Journal of Field Ornithology. vol 56, no 4. Rohweder MR, McKetta CW & Riggs RA. (2000). Economic and biological compatibility of timber and wildlife production: an illustrative use of production possibilities frontier. Wildlife Society Bulletin. vol 28, no 2. p. 435-447. Roland J, Hannon SJ & Smith MA. (1986). Foraging Pattern of Pine Siskins Carduelis-Pinus and Its Influence on Winter Moth Operophtera-Brumata Survival in an Apple Orchard. Oecologia. vol 69, no 1. p. 47-52. Scott VE & Crouch GL. (1987). Response of Breeding Birds to Commercial Clearcutting of Aspen in Southwestern Colorado USA. U S Forest Service Research Note RM. vol 475, p. 1-5. Tallman DA & Zusi RL. (1984). A Hybrid Red Crossbill Pine Siskin Loxia-Curvirostra X Carduelis-Pinus and Speculations on the Evolution of Loxia. Auk. vol 101, no 1. p. 155-158. Unitt P, Rodriguez Estrella R & Castellanos Vera A. (1992). Ferruginous hawk and pine siskin in the Sierra De La Laguna, Baja California Sur: Subspecies of the pine siskin in Baja California. Western Birds. vol 23, no 4. p. 171-172. Wright DH. (1996). Intermittent birding at Prince Albert, 1982-1985. Blue Jay. vol 54, no 3. Yunick RP. (1976). DELAYED MOLT IN PINE SISKIN. Bird-Banding. vol 47, no 4. p. 306-309. Zamora J, Ernesto L, Ruiz-del-Valle V, Moscoso J, Serrano-Vela JI, Rivero-de-Aguilar J & Arnaiz-Villena A. (2006). Rhodopechys obsoleta (desert finch): a pale ancestor of greenfinches (Carduelis spp.) according to molecular phylogeny. Journal of Ornithology. vol 147, no 3. p. 448-456. Zinkl JG, Henny CJ, Lenhart DJ & Roberts RB. (1980). Inhibition of Brain Cholin Esterase Activity in Forest Birds and Squirrels Exposed to Aerially Applied Acephate. Bulletin of Environmental Contamination & Toxicology. vol 24, no 5. p. 676-683. Ĉi tiu paĝo estis lastafoje redaktita je 19:52, 28 jan. 2018.